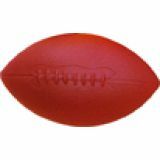 The High Density Coated Foam Bullet Football is great for younger children. 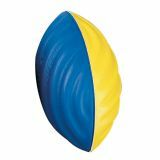 Soft enough to be tossed without the fear of painful impact, these foam blue/yellow footballs feature a molded wave pattern, and have a soft coating for durability. 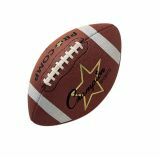 The Official Size Composite Footballs are great for practice and recreational play. 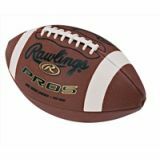 Featuring a water resistant composite easy grip cover, 2-ply butyl bladder, and tackified laces, these balls are designed to play and feel like a leather game ball. 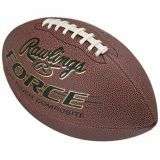 FORCE Footballs feature a durable PVC composite cover and thick, high-strength composite lace. 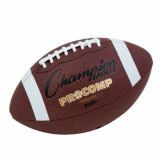 Intermediate Size Pro Comp Series Football meets HS and NCAA specifications, and is great for training & skill building. 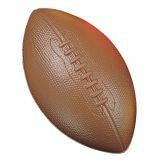 Featuring a tacky, water resistant pro composite cover, 2-ply butyl bladder, and raised laces, it plays like a leather game ball. 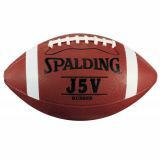 The Junior Size Pro Comp Series Football meets HS and NCAA specifications, and is great for training & skill building. 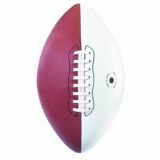 Featuring a tacky, water resistant pro composite cover, 2-ply butyl bladder, and raised laces, it plays like a leather game ball. 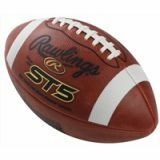 PRO5R Footballs feature rubber construction and thick composite lace. 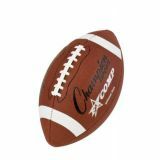 This football features new painted stripes that are 67% more durable than the industry standard; enhanced tack, center-cut and rubberized laces. 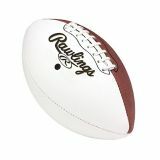 Soft Touch Technology construction with unique 3-ply laminated lining offers better control and grip.